You should only really be considering this option if you have a fairly substantial garden, but if you do then continue reading. 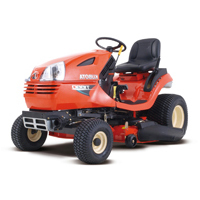 On a riding mower you’ll get a large cutting deck positioned close to the front end of the machine, a seat allowing you to sit on the mower and a set of steering controls not too dissimilar to what you find on a car (steering wheel etc). 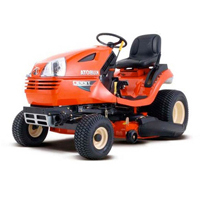 There are a range of cutting deck sizes available and they are designed specifically for cutting grass, unlike lawn tractors which can also be used for various other odd jobs. 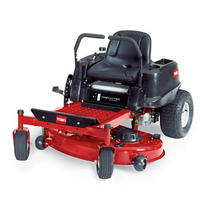 Time Saved – A riding mower will save you heaps of time if you have a large garden to maintain. They have much larger cutting decks than any walk behind mower, so cut a lot more grass on each pass. Less Effort – Cutting a large garden with a walk behind mower can be pretty tiring but with riding mowers you substitute your legs for the mower’s wheels. A lot easier! Fun Mowing – Cutting the grass doesn’t have to be a boring, tedious task that you dread each time it comes around. Not with a riding mower at least because it’s actually pretty fun driving one of these around. 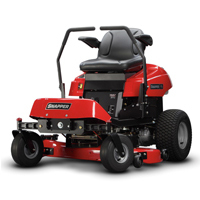 Maneuverability – Because of the cutting deck’s position you get a greater range of motion in comparison to a lawn tractor. This is definitely an advantage if you have any obstacles in your garden that you need to navigate your way around.